Henry Marsh is handy with tools. His favourite hobby is woodwork: "I love to work with my hands," he says. That is just as well, because when not working with the lathe, Henry is wielding scalpels in the operating theatre as one of the UK's most respected neurosurgeons, or, sometimes, boring a Bosch drill into the brain of a conscious man. 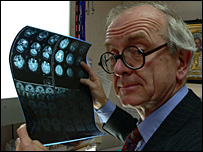 Fifteen years ago, Henry visited Ukraine to give a series of lectures on brain surgery. He was shocked by what he witnessed. Decades of under-investment in medical services in the former Soviet state had left it with little infrastructure or expertise in neurological conditions. Patients with the kind of benign tumours which would be quickly identified and excised in the UK had been left untreated with terrible results. "It was like being in a horror film," he recalls, as he watches home video images of the huge tumours growing on the heads of the patients. On his trip, Henry met one Ukrainian surgeon who was trying hard to make a difference. Igor Petrovich had been enduring constant threats and harassment as he tried to reform his department at the Military Hospital in Kiev. Petrovich combines a revolutionary zeal with a droll wit: "That is the problem with what we do," he has remarked to Henry, "We can often kill people." He impressed Marsh so much that Henry brought him to London for further training. Ever since that fortuitous meeting, Henry has been visiting the Ukraine at least twice a year to share his expertise and undertake complex operations with Igor. He normally arrives bearing gifts - disused medical equipment from St George's Hospital, Tooting - often packaged in boxes made in his shed at home. He is struck by the wastefulness of the NHS: a drill bit he delivered to Igor has been used for ten years. In the NHS it was thrown away after a single use. The lack of equipment in Ukraine has forced the surgeons to improvise when it comes to some of the most basic surgical tools. Last year, Marian Dolishny discovered just how effective Henry's impromptu surgical methods can be. The young man from rural Ukraine had a tumour pressing on his brain, and was developing epilepsy. Untreated, blindness and then death would follow. Surgery to remove the tumour would be a cinch in Henry's state of the art operating theatre in London. In Kiev, though, it was a different matter. As they left Igor's flat on the morning of the surgery, bearing a home-made hose for the anaesthetic, nerves were beginning to jangle. "I'm not tense," Henry snapped at Igor. "You just keep on bringing me harder and harder cases - bloody Kossaks." Lacking the advanced anaesthetics needed to operate on Marian without risk of paralysis, Henry and Igor had only one option - to operate whilst Marian was still awake, testing his ability to move as he operated. That meant Marian was fully conscious for the most dramatic part of the operation, when Igor used a Bosch drill bought in the local market to bore four holes into his skull. His face remained remarkably impassive, though when asked about the noise his response was telling: "I can't hear what you're saying". Marian's surgery was a success, and Henry and Igor were delighted. Not all Ukranian medical stories are such fairytales. Henry is haunted by the case of Tanya, a young girl whose tumour ultimately defeated him. He still likes to visit her grave when he is in the country, and meet up with her mother Katya. "I don't know if I'll be thinking anything when I die," he said, "but if I am I'll be thinking that what mattered most was trying to help Igor and his patients, and I'll think about Tanya and Katya. "What are we if we don't try to help others? We are nothing. Nothing at all." You can see Storyville: The English Surgeon on Sunday, 30 March at 2250 BST on BBC Two, and for seven days at BBC iPlayer.